Competitive intelligence reduces uncertainty by delivering the strategic knowledge and foreknowledge necessary for better business decisions. It saves money or makes money—every time. Seena Sharp has been delivering this message—and practical techniques for turning information into intelligence—for 30 years. That’s why John Wiley & Sons commissioned her to share her expertise in Competitive Intelligence Advantage: How to Minimize Risk, Avoid Surprises, and Grow Your Business in a Changing World. Download a sample chapter and start reading! “After reading this book, you will see your business differently, because you will see the world differently.” —Steve Moya, consultant and former Senior VP and CMO, Humana, Inc.
“By identifying sources of new information to help grasp an understanding of the changing marketplace and by identifying available sources of intelligence about trends and future markets, Sharp’s remarkable book will help small and large business owners keep ahead of their market. They can learn to ride the wave of continuous change rather than be engulfed by it.”—Don Bushnell, Professor Emeritus and Founding Dean, Fielding Graduate University. 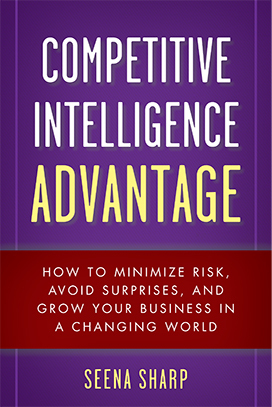 Amazon customers have given this book five-stars more than 80 times—more than any other book on competitive intelligence. In fact, 98% of Amazon readers rate it four or five stars. 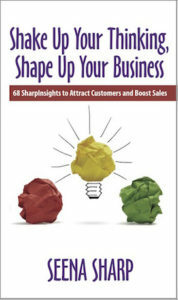 Shake Up Your Thinking, Shape Up Your Business: 68 SharpInsights to Attract Customers and Boost Sales is a compilation of the short, snappy dispatches from Sharp Market Intelligence. Subscribers around the world learn about new approaches, emerging opportunities, and surprising trends. Both books are avaiable on Amazon. What do you need to know to make the best possible decision for your product, service, or company? We assemble a team and customize an investigation to discover all facets of your problem or opportunity, then transform our findings into a powerful competitive advantage. Contact us to get started. …plus many other terrific companies with less-familiar names! Sharp Market Intelligence has worked with start-ups, multinational corporations and everything in between. Visit the Clients page to see more.